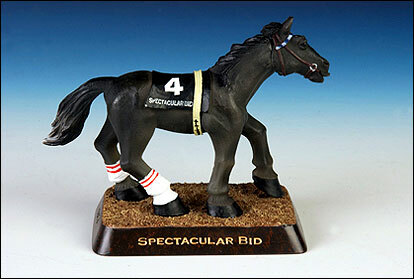 Spectacular Bid Bobble Another piece in our popular bobblehead line of Thoroughbred heroes commemorating the great gray 1979 Kentucky Derby winner, Spectacular Bid. The bobble was released in conjunction with a Churchill Downs give-away promotion limited to the Twin Spires Club members. 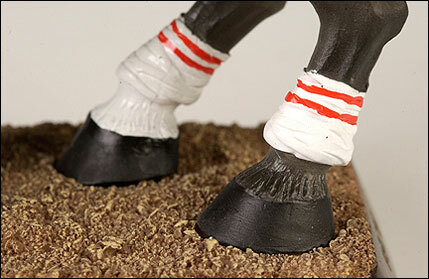 For those of you who were unable to originally acquire one, or simply wish to continue expanding your bobblehead stable, Secretariat.com is once again your source for this whimsical equine collectible. 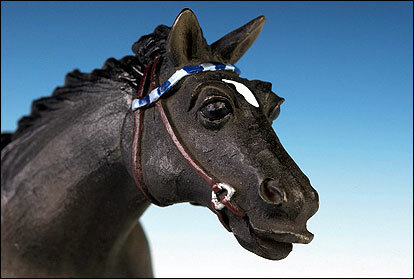 The Spectacular Bid bobble portrays the gun-metal gray colt in detail from his sky and navy blue headband to his white tipped tail. Measuring nearly 6 inches long by 5.5 inches tall, the Spectacular Bid bobble is made in the same great style and quality of our previous bobbles. Only available through Secretariat.com with a total of 8500 pieces produced in the entire edition.